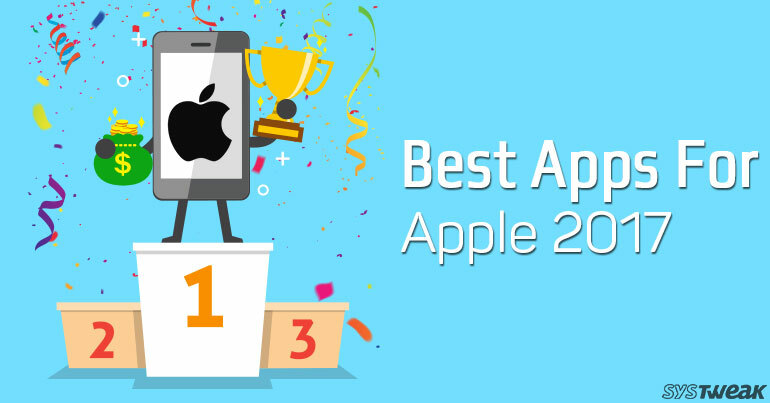 These Are The Best Apps For 2017", Says Apple! “These Are The Best Apps For 2017”, Says Apple! Apple has released its list of best apps of 2017 and yes we see some of our favorites . Let us delve into what each app is about and how they made it to this list of the best apps. Affinity Photo is a professional editing tool for iPad. The app has some of the most powerful editing tools that are available today. The tool allows professional image processing, retouching and correction tools, and advanced brush engines. A preferred app by photography professionals, it tops the list of the best apps on App Store. Explore more about the app from here. Another photo app, Aurora HDR 2018, is the most popular HDR photo editor for Mac. 2017 has been about HDR photos and the trend shall continue in the coming year because of the life that it infuses in photos. The beauty about the app is that while it is the most advanced HDR app in terms of features, yet it is extremely easy to use. The app is powered by Artificial Intelligence, which means that you will not have to make endless adjustments to get that perfect photo, it will do the job for you. The app has image fixing tools like, Lens Correction and Image Radiance which improve the photo. It can handle different formats of photos, TIFF, JPEG and PNG. Aurora HDR has presets which they have introduced in collaboration with recognized photographers. These presets come in handy while clicking photos in specific set ups. Know more about the app from here. The most popular food app in Canada and USA, ChefsFeed is an all rounder app for all the foodies. The app offers to its users, food videos, stories and guides. It is known to offer credible recommendations about eating places and the sources are none other than top chefs across the globe. What else could we ask for? We like how the app is different from the rest in its league, by bringing in recommendations from professionals in the field instead of reviews. Check out more details about this app from here. Ekibo, the app of the year in Japan, is a part of this list of the best apps, for all the right reasons. Ekibo is a cute pet AI which grows while you are commuting in trains across Japan. Each station or location that you halt at or cross by, Ekibo will learn more and accordingly grow. As its knowledge base increases, Ekibo will recommend to you local places that you must visit and also show selfies from different areas. Every user has his own personal map of Japan which will keep evolving and growing as you travel more. Ekibo is a fun and cut app which keeps you occupied during the boring long commutes. You must have a look at this app from here. It is the App of the year for many countries across the globe. For all those who love making and editing videos this is the perfect app. Enlight Videolap lets it users get creative with their videos. From making professional movies to memories to share with loved ones, this app will assist you by offering the best video editing tools. The app is equally suitable for both professionals as well as novices. It has some amazing features like, Creatively Mix Videos, Add Texts & Emojis, Hollywood Green Screen etc. What are you waiting, create beautiful memories this festive season with this app.You can get it from here. App of the year on Apple Watch in Australia, Japan, New Zealand and USA, iTranslate Converse converts your device into a translation gadget. This translation app is simple and easy to use. The app translates anything spoken almost in real time and works well even in noisy environments. So far, it can translate upto 38 languages and also record transcriptions of all voice conversations. The world is becoming conscious about health and so amongst the plethora of health and fitness apps available we were expecting one of the apps to be in the list of top apps. RunGo offers turn-by-turn voice navigation to their users which makes it a fun experiencing to run as well as explore new routes and paths. The app has more than 100,000 routes yet gives users the options to create their own unique route. Like other top fitness apps it also shares stats like, time, pace, splits, distance and elevation. To download this fitness app visit here. So these are the best that the editors at Apple have shortlisted for 2017. We do have some of our favourites on the list and are a little disappointed not to see some of them. Do let us know your favourites of this year and the ones that made it to this list!